In Summer 2018, Instagram finally smashed the 1 billion users milestone. Today, Instagram is one of the most popular social platforms on the web. It’s a place where people create, share and interact with both their friends and their favorite brands. 80% of Instagrammers follow businesses on the channel. As with any social platform, brands that want to get the most out of Instagram need a substantial following. More followers mean more interactions, greater credibility and a stronger online presence. The problem is, Instagram growth is more than just a numbers game. Companies tap into the $6.48 billion worth of revenue Instagram churns out per year by making real connections with the people on their page. If you’ve considered buying followers to boost your IG presence, you’re not alone. Influencers, celebs and even politicians have all experimented with buying followers in the past. When you’re just getting started on IG, it’s hard to convince customers that you’re worth your time when you only have one or two existing fans. However, if you already have a few thousand people in your follower count, you instantly seem more credible. Unfortunately, crowd mentality will only get you so far. Paying for followers means that you get nothing more than a number. In other words, the people you’re posting to aren’t going to like your photos, share your content or buy your products. At the same time, paying for followers also goes against the IG community guidelines, which means you could risk an account purge. So, if you can’t buy followers, how do you stand out among the 25 million businesses active on Instagram? The answer is simple – learn how to grow your followers organically. Of course, actually doing so takes a little more effort. Read on to learn strategies for engaging audiences & bringing in organic followers. Instagram has the highest interaction levels of any social media channel. Your followers are waiting to connect with you, but you need to give them something to respond to first. People are looking for consistency and timeliness from the brands they follow. What’s more, the Instagram algorithm considers your presence on the app when deciding where to rank you on the Explore page. However, when you start planning a regular posting schedule, you need to get the timing right too. It’s no good posting pictures for your audience of busy moms when they’re in the middle of a school run. Our studies show that the best time to post on Instagram (for most businesses) is 3 pm on a Wednesday, 11 am, 3 pm and 4 pm on a Thursday and 5 am on a Friday. You’ll need to do some of your own digging into details like your industry’s audience habits to make sure that schedule works for you. 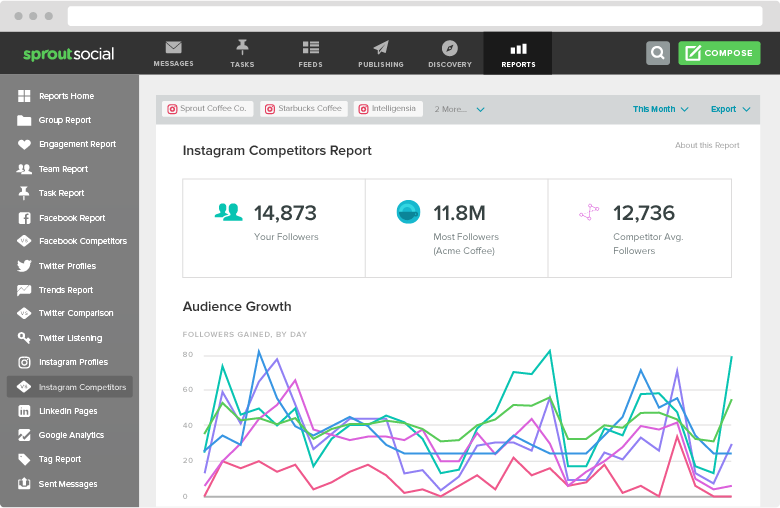 Check out your Instagram insights to see when your followers are most active. 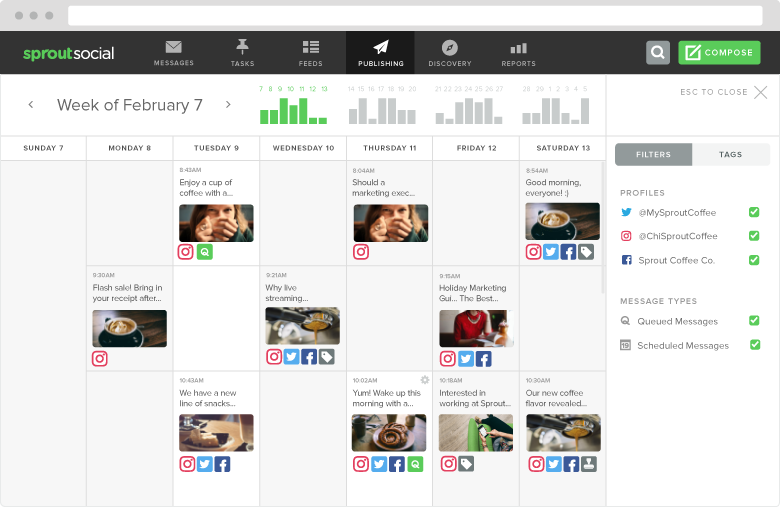 If you’re worried about having time to run a business and manage Instagram growth on a regular basis, consider using a scheduling tool like Sprout Social. Prepping posts ahead of time ensures you have a steady stream of content waiting, even when you’re busy with other things. Use tools to track performance: With a tool like Sprout Social, you can follow the keywords that are sending the most traffic your way, and learn what’s working for your top performing posts. For example, 65% of all the ad impressions on Insta come from video. Experimenting with story ads increases your marketing recall, improves purchasing intent and enhances click-through rate all at the same time. One campaign by DiGiorno accomplished an incredible 6 point lift in purchase intent, an improved reach of 20 million and an 8 point rise in ad recall. Liking a comment, answering a question, or even responding to a direct message all help you build deeper relationships with your followers. In fact, according to Sprout Social Insights, answering consumer questions on social media drives 49% of fans to purchase. Hashtags are easily one of the most important parts of achieving Instagram organic growth, and can drive engagement on your posts. What’s more, now that people can follow hashtags on IG, it’s easier to expand brand reach with the right tags. The question is, what is the best way to use hashtags? The rules have changed in the last year, with IG placing more focus on “relevant” tags that offer unique value to followers. Today, you can’t just post the same 11 tags on every photo and expect results. Instead, you need to find the right combination of brand-boosting tags for every image. Branded hashtags: Use your company name or a unique tag to generate engagement for your brand. 70% of Instagram’s hashtags are branded. Trending tags: Check out the tags that are appearing in the Instagram Explore page. Are any of them relevant to your brand or content? Consider adding them to your posts to expand your reach. Popular hashtags: While #Love, #TBT and #InstaGood are tough to rank for, they still have a place in certain types of content. Consider adding 3-5 popular tags to your images and stories. Location tags: Posts with geotags earn up to 79% more engagement. You’ll find the geotag in the top left of your post. For an instant strategy boost, use Sprout Social’s Instagram competitors report to find which of their hashtags are generating the best response. Struggling to achieve measurable Instagram growth alone? Why not have your existing followers help you out? Consumers are 7 times more likely to buy from a brand suggested by their peers. What’s more, @mentions and tags from your customers help you to reach new audience members that you may never have found on your own. There are plenty of ways to cultivate UGC. One of the easiest options is to run a competition with a branded hashtag. Give your customers the chance to win something special if they share pictures of themselves with your product, follow your profiles and tag their friends in the comments. Learning how to grow your followers on IG organically is tough. Real progress takes time because you need to earn consumer respect and demonstrate your credibility in a cluttered marketplace. A great way to instantly turbo-charge your efforts is to piggyback on the existing influence that someone else in your space already has. Influencer marketing on social media is one of the easiest ways to amplify your voice on IG. With the right influencer, you leverage the trust that already exists between an Instagrammer and their following, to expand your brand reach. Find influencers in your field by searching for industry hashtags and begin building a relationship with them as soon as possible. Finally, remember to drive attention back to your Instagram page from other locations online. Don’t assume that the people following you on Facebook and Twitter also know you’re active on Instagram. Link back to your Instagram posts on Facebook, mention your branded hashtags in your emails and screenshot pictures from Instagram for your blog posts. The more attention you bring to your IG profile from other locations on the web, the greater your brand reach gets. What’s more, by building your presence on other channels you may boost your credibility enough to earn a chance at Instagram verification. Figuring out how to grow your followers safely and organically isn’t easy. The best Instagram accounts take a significant amount of time and effort to create. It’s no wonder that busy brands often resort to shortcuts like buying followers instead. Don’t be tempted by the dark side. While it might seem like a good idea at first, it ultimately won’t do anything for your business bottom line. Instead, make sure you focus on organic growth, careful content creation and consistent measurement. Use Sprout Social to track the success of each campaign and you’ll have a substantial genuine following.